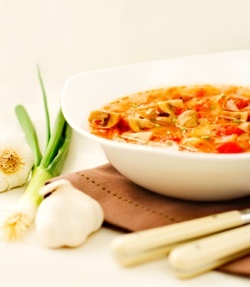 7 Day Vegetable Soup Diet Recipe. Instructions for making the fast weight loss soup and daily menus for losing 10 pounds in 7 days. Before we begin, I want to state that I do not believe in dieting. I do, however, believe in soup and the power of certain soups to diminish fat. For the purpose of dropping pounds, soup in general, is the sensible low calorie food because it has lots of volume while delivering a variety of nutrients. The first trick to keeping your diet soup low in calories is to avoid adding fat. Cream, full fatted milks and fatty meats are the biggest culprits. Trick number 2 is to add very low calorie foods. Celery is a magic 'negative calorie' vegetable which means that it takes more calories for your body to digest the celery than is actually contained in the celery. Our recipe includes a full celery bunch to kick those fat burners into high gear. The original miracle soup diet was criticized for it's super low protein content which caused some dieters to feel faint. We've added low fat protein sources to keep the diet more balanced. The 7 day vegetable soup diet is also known by names such as "Mayo Clinic Diet" and "Sacred Heart Hospital Diet", which gives the impression that these institutions are linked to or approve of it. No institution has claimed an association to the cabbage soup diet nor do any endorse the 7 day soup diet method. This is NOT a long term diet. It is a 7 day diet in which you should lose approximately 10 pounds and the 7 day course should not be repeated for at least 2 weeks. It is quite restrictive and you should discuss any diet plan with your healthcare professional. Here's how to make your own fast weight loss soup. Add seasonings of your choice; salt, pepper, parsley, herbs de provence, basil, curry, dill, etc. Spritz a 5-Quart Dutch Oven with oil spray and set over medium low heat. Add onion and begin to saute. Meanwhile clean and seed the green peppers, chop into bite sized pieces and add to the pot and stir. Peel the outermost layers from the cabbage, cut and core then chop into bite sized pieces and add to soup pot and stir. Scrub carrots and trim ends off. Cut into coins and stir into pot. Brush off mushrooms, trim stem end, slice or quarter and add. 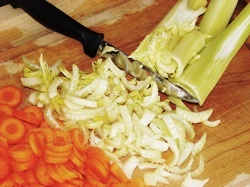 Rinse celery and chop, crosswise, leaves and all into 1/2 inch (1cm) pieces and stir into mixture. Add seasonings, onion soup mix and bouillon cubes. Not sure which herbs to add? Experiment by seasoning a bowl at a time with any combination and simmering on the stove top for 15 minutes to blend the flavors. Try a different herb every day to change things up a bit. They're nutritious and add a ton of flavor. Or add a handful of spinach to your daily soup. Eat Regularly - Eat as many as six times a day - about 2 to 2.5 hrs apart. Your body never goes into fat storage mode once it comes to expect a regular intake of food. Don't eat more food... just eat it differently. Activity - The more calories you burn... the more calories you can eat. Weight loss is simple mathematics, if you burn more than you eat, you lose weight... if you burn less than you eat, you gain weight. Fluid Intake - Fluid makes you feel full and aids digestion. Additionally, 6 glasses of fluid per day gives you a healthy, dewy complexion to go along with your new svelte body. 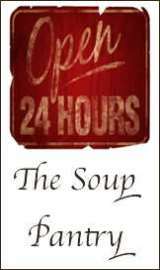 Soup - Eat at least one bowl of soup per day and more on specified days. Non Fat Dairy - 1 Cup (8oz) skim milk or 1/2 cup non-fat, plain yogurt. Use it however you like - drink it, add to fruit smoothies, add (yogurt) to soup. Tea, Coffee, Water - without cream or sweetener - you can use some of your daily allowance (1 cup) of skim milk if you wish and - if you absolutely must, you can add artificial sweetener. Seasonings - Fresh, frozen or dried herbs, spices, low or zero calorie flavorings. Add the following daily food items to your every day foods above. Soup - Eat as much soup as you want. Every Day - Foods listed above under every day. Vegetables - Fresh or frozen, cooked or raw - today is vegetable day, *NO FRUITS. Potato - Large baked potato with butter. Low or no fat dressing - 1 tablespoon of salad dressing. Fruits and Vegetables - All the fresh or frozen fruits and veggies you can eat. Cooked or raw. *NO POTATO. Protein - 1 hard boiled egg. Bananas - You can have as many as eight bananas today. Skim milk - Drink all the skim milk you want. Protein - Grilled or broiled beef, skinless chicken or fish (20 ounces or less - 500 grams or less). Protein - All the fish, skinless chicken or lean beef (grilled or broiled) you can eat. Brown Rice - Have as much brown rice as you can eat. Vegetables - Unlimited cooked or raw vegetables. Eat as much of it as you want! The more soup you eat during the 7 days you're on the vegetable soup diet... the better. For weight maintenance have a bowl of soup as your big meal 2 times a week. Copyright © 2011 - 2012 - D Anderson. All rights reserved.